March has seen some great progress for our city, especially for our workers. Last night, City Council heard some very important issues and passed several ordinances that were long overdue. City Council made history last night when we passed Austin's Fair Chance Hiring Ordinance. For far too long members of our community who have been incarcerated or who have been directly affected by a family member's incarceration have struggled with reentry and have been unduly burdened with many obstacles, especially in regards to employment. During the City Council meeting I heard personal stories from members of our community that have reaffirmed my belief that everyone deserves an opportunity for gainful employment. No one benefits when a qualified worker is barred from a position before their experience, skills, and potential are taken into consideration. Let me be clear - this civil rights ordinance does not force employers to hire someone with a criminal record, however, it does allow those who have been though the criminal justice system to receive fairer consideration during the hiring process. This is the first ordinance of this nature to be passed in the South, and Austin should be proud to have made this first step in achieving substantial criminal justice reform. The AUSTIN AMERICAN-STATESMAN wrote a great article covering City Council's decision. As many of you may know, one of my priorities on Council is to promote the creation and preservation of affordable housing, however, housing is only one piece of the affordability puzzle. Another approach we can take with our affordability crisis is to make sure that the City of Austin is paying all of its workers, contracted or subcontracted, a living wage. So when a living wage ordinance came to Council last night, I was happy to support Council Member Casar's resolution to establish a living wage for city projects. Here is a very informative article on the issue from the AUSTIN MONITOR. We must ensure that equality is maintained and protected in the work place. That's why I was in full support of Mayor Pro Tem Tovo's resolution that directed the City Manager to review the Austin's anti-discrimination policies and protocols, particularly regarding the City of Austin's Personnel Policies. This resolution also directs the City Manager to update definitions of discrimination, harassment, and retaliation, provide guidance for employees seeking accommodation for physical or mental differences, provide an anonymous complaint mechanism, and establish an objective third-party appeals process. This is a powerful resolution that is helping address and remedy intolerable inequalities in the workplace. Earlier this March, I Co-Sponsored and the City Council approved the Austin Music and Creative Ecosystem Omnibus Resolution introduced by Mayor Adler. We will not continue to be the Live Music Capital of the World if musicians cannot afford to live here and music venues cannot afford to stay open. This omnibus resolution will put us on a path towards protecting and fostering creative communities by looking into streamlining the permitting process, creating a safety net for artists, and exploring the potential of creating an entertainment license which would make it easier for venues to operate and support live music without all the red tape. We've done some great things this month and plan to keep pushing forward to tackle the big issues facing our city. Annual Cesar E. Chavez "Si Se Puede!" March. Dont Forget Cesar Chavez Day is March 31st. and Austin's Annual Cesar Chavez March is this Saturday, March 26th. You can find more info on the Celebration and March by following the link in "Upcoming Events" section of this newsletter. 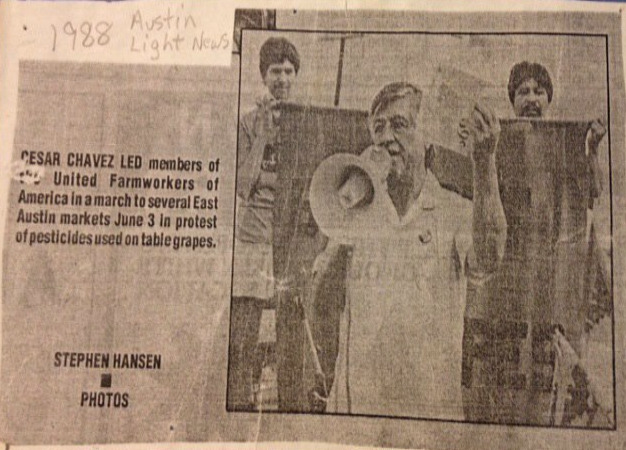 Please enjoy this old old picture of Cesar Chavez, my son David and a much younger me in Austin, Tx. Have trouble viewing this email?